The Premier Inn Birmingham NEC / Airport is ideally situated adjacent to the National Exhibition Centre complex. It is a short walk from the Northern Exhibition Halls and a 5 minute drive from the NEC Piazza or Arena. The hotel is also just one mile from Birmingham International Airport or the Birmingham International Railway. Standard Room facilities include a private bathroom, tea/coffee making facilities, TV and phone. Rooms also have a hairdryer, satellite TV channels, a radio, wi-fi, air conditioning and ironing facilities (on request). Non-smoking rooms are available. Cots are available on request. Bedrooms for disabled guests are available. Guide dogs are allowed. Wheelchairs can fit into lifts. Ground Floor Rooms are available. 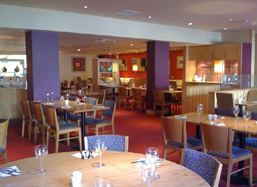 Bar and integrated restaurant serving a mix of traditional and contemporary dishes. The restaurant is closed from 20 December to 3 January. From M42 take J6 signposted for NEC. Follow signs into the NEC complex. Turn right towards North Way. Follow Premier Inn signs. Hotel is on the left at the fifth roundabout.